This type of construction is composed of an odd number of veneer plies. The middle ply is called the "center" and plies on either side of the center but beneath the outer plies are called cross bands. Outer plies are called "faces" and "backs." Panel thicknesses are available from 1/8" to 1-1/2";1/4" or thinner. Panels are normally 3-ply; thicker panels are 5 to 11-ply or more. 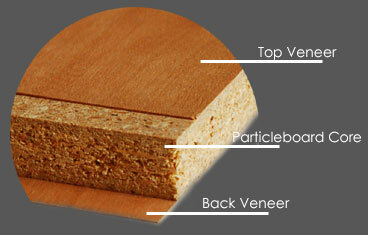 The Face and back veneers are applied directly to a core of particleboard. 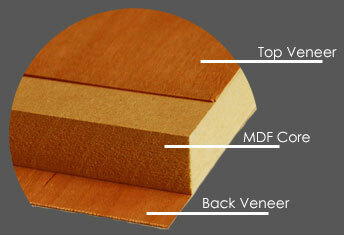 The face and back veneers are applied directly to a core of (MDF) medium density fiberboard. This type of panel construction is the most stable of all plywood. 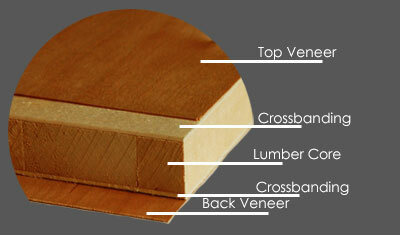 This type of construction is usually 5-ply consisting of a face and back veneer, two cross-bands and a core composed of strips of lumber edge glued into a solid slab.